This week at the Farmer’s Market…. I’m excited about what’s happening in Monticello. I really think that people are awakening to a more nourishing way of life. The 3 year old Farmer’s Market in town is becoming proof. There are lots of yummiess at the market. You’ll be able to find lots of fresh produce as well as local honey and crafts. Come hang out with us on Tuesday nights from 4:00 – 6:00pm. The Monticello Farmer’s Market is in the little park by the Court House and Detention Center in Monticello. It is often my custom to read a chapter of Proverbs every day. I love the wisdom contained in the pages. Even though I read it often, it seems like new nuggets of wisdom jump out at me regularly. My dad always used to suggest that to people, and I even suggest it myself, now. Proverbs has 31 chapters, and it is know as the book of wisdom. There’s one chapter of wisdom for every day of the month! As I was sitting in my comfy chair reading Proverbs 26 this morning, verse 17 stuck out to me so much. It was almost like a ton of bricks just fell in my lap! Not every pot we walk by in life needs to be stirred. I tend to feel like I know what is best not only for me personally, but for all those around me as well, and if you don’t believe me, just ask me! It’s something I have been working on in my personal growth and in my pursuit of less. I can wear myself out with a quickness trying to attend to the affairs and business of others. I am learning that managing my own life is enough for me. I never would have considered myself a busy-body or a gossip – although that certainly applies with this scripture. What I’m talking about for me is feeling the need to share from my pearls of wisdom how things should be done, and if it still isn’t done in a way I would like, then I’d get in there and do it for them! Granted, some areas of my life demand that I get involved. Some areas of your life demand the same from you. These are our pots. They are our responsibilities. I operate a private school. What happens in that school is my business, and I need to be involved. I need to stir that pot. Those of you with children, your child is one of your pots. It is totally ok and necessary to be in your child’s business. I’m not asking anyone to let go of their responsibilities. What we are talking about is letting go of things that we can’t or don’t need to control. We can’t make other people do what we want them to do! Believe me, I have tried!! It usually doesn’t end successfully. Do we really need to instruct our spouse on the proper way to chop an onion or load a dishwasher? My puppies wouldn’t like it very much if I picked them up by their ears, and Proverbs tells us the people that surround us won’t like it very much when we meddle in areas that are not ours in which to meddle. More often than not, my need to unnecessarily control will end in the other person resenting me, and I end up with needless emotional turmoil. Too many cooks in the kitchen makes for a bad meal. We can walk past the pot without picking up the spoon to stir it. Just a side note: Leviticus 19:17 AMP tells us, “you shall not hate your brother in your heart; but you shall surely rebuke your neighbor, lest you incur sin because of him.” Galatians 6:1 AMP also says, “Brethren, if any person is overtaken in misconduct or sin of any sort, you who are spiritual should set him right and restore and reinstate him, without any sense of superiority and will all gentleness, keeping an attentive eye on yourself, lest you should be tempted also.” There are times that we need to get involved. There are times when we need to call sin for what it is; however, the majority of the time, we just need to focus on our own business and let everything else be. PRAYER STARTER: God, grant me the wisdom to stay in my lane. Help me to know what to say and when to say it. Show me what pots are mine, and give me strength to let go of unnecessary control over others. Thank You for peace that passes all understanding. I thank You that the Holy Spirit leads, guides, and directs me in every step I take. I’ve heard it said, “Holding a grudge doesn’t make us strong; it makes us bitter. Forgiving doesn’t make us weak; it sets us free.” Isn’t that the truth! Every single day, we are given multiple opportunities to be offended by others. Someone cuts us off in traffic – now we’re offended. Our husband or wife says something to us in a less than loving tone – now, we’re offended. We didn’t get the grade we thought we deserved – now, we’re offended. We feel like we were overlooked for a promotion – now, we’re offended. We find out someone has been spreading gossip about us – now, we’re offended. Our friend doesn’t want to do something we want them to do – now, we’re offended. In those moments, we have to decide if we are willing to trade our peace for offense. We don’t have to be offended. We choose to be offended. An offence is defined as something that is designed to irritate, annoy or anger; cause resentful displeasure; to affect disagreeably; to hurt or cause pain. If I don’t watch myself, picking up offences can become a daily habit. Luke 17:1-5 tells us, “He [Jesus] said to His disciples, “Offenses will certainly come, but woe to the one they come through! It would be better for him if a millstone were hung around his neck and he were thrown into the sea than for him to cause one of these little ones to stumble. Be on your guard. If your brother sins, rebuke him, and if he repents, forgive him. And if he sins against you seven times in a day, and comes back to you seven times, saying, ‘I repent,’ you must forgive him.” The apostles said to the Lord, “Increase our faith.”” Jesus was telling us that there is no way getting around opportunities to be offended; however, when those times arise, the choice the believer must make is to forgive and let go. Upon hearing this, the disciples said, “increase our faith!” They knew how easy it can be to feel justified in our offended state. We need faith in God that when we release it to Him, He will take care of it and heal our hearts. There are three types of offense we will face in life. The first type is imaginary offense. This happens when we perceive some type of hurt that is simply not there or didn’t happen. The next is accidental offense. This type of offense happens when a person unknowingly does something that hurts our feelings or upsets us. The third type of offense is real offense. This is when a person does something on purpose to cause pain to another person. We face these situations every day. They come at us like little presents waiting to be opened. When faced with offenses, we must decide whether we will pick them up or leave them there and keep going. Acts 24:16 tells us, “Therefore I always exercise and discipline myself [mortifying my body, deadening my carnal affections, bodily appetites, and worldly desires, endeavoring in all respects] to have a clear (unshaken, blameless) conscice, void of offense toward God and man.” It will take exercise and determination to not be offended when bad things happen. If we are going to live a life free of offence and unforgiveness, we are going to have to daily work at it. Forgiveness doesn’t come naturally. Our flesh wants to get even or see people get what they deserve. This type of thinking is dangerous. It will evolve in to bitterness and slowly eat us up from the inside out. Weekly Devo: When did rest become a four letter word? When Did Rest Become a Four Letter Word? Does this sound like you? Our culture values busy. Ask anyone walking the social mecca of Monticello, also known as Wal-Mart, how they are, and I would almost guarantee they will say, “I’m so busy!” What are we busy doing? Are we being fruitful, or are we just grinding on the daily hamster wheel of life? I used to value busy. I used to think that the more things I could pack into my answer somehow made me more awesome, more productive, or more spiritual. I found that all it really made me was grumpy and exhausted. I would come home at the end of the day wondering where my day went and why little to no progress was being made. This tells us the enemy is seeking to destroy our quality of life. He comes to steal away precious moments which God gives us to steward. He comes to steal family dinner time, precious time praying and interceding for others, time spent seeking God and reading His Word, and seeks to exhaust us to the point where we are ready to give up. When speaking about Satan, the Prophet Isaiah said in Isaiah 14:12, “How have you fallen from heaven, O light-bringer and daystar, son of the morning! How you have been cut down to the ground, you who weakened and laid low the nations [O blasphemous, satanic king of Babylon! ]” He wants to weaken us and take our joy. No one who is exhausted is full of joy. Why does he go after our joy? Nehemiah 8:10 tells us that the “joy of the Lord is our strength.” Without joy, the believer is rendered powerless. However, the blame cannot be given entirely to Satan. Eve tried that trick in the garden by blaming Satan for eating the fruit, and God didn’t buy her “the devil made me do it” defense. I have found that sometimes I can do a better job than Satan of putting on myself much more than I can bear. Then, I begin the blame game of trying to ask God why He gave me so much to handle, or trying to tell myself that the old Devil is just stealing my time. In reality, when I am overwhelmed to the point of being ready to quit, it’s normally me stepping outside of God’s intention and design for my life. God is calling us to come away with Him. He’s calling us to a more intimate relationship with Him. 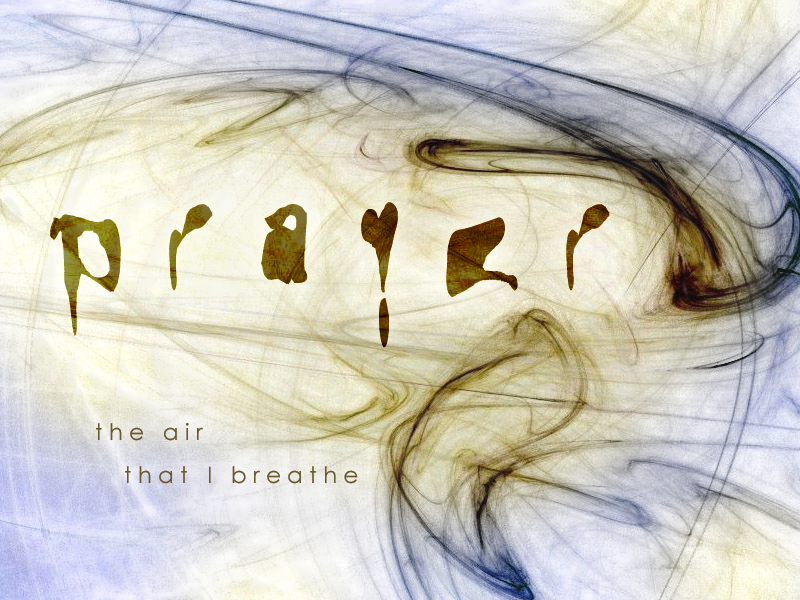 That type of intimacy can only happen when we can devote time to Him – to prayer and reading His Word. We will only be able to devote time to him when we begin to edit our life. Not every good thing we do is something that God intended for us to do. Maybe, the kids don’t need to have 5 extra curricular activities each. Maybe, we don’t need to volunteer for everything going. Maybe, we don’t need to say yes to every opportunity that presents itself that seems good. Maybe, we can learn to be content with doing less, having less, and being less. This line of thinking sounds so weird doesn’t it? As I read those words back, I can almost picture the look on your face. When we are willing to let go of a life lived pursuing the “Joneses,” then we can make room and time for a life lived pursuing the Master. I’m reminded of Luke 10 beginning in verse 38: “Now while they were on their way, it occurred that Jesus entered a certain village, and a woman named Martha received and welcomed Him into her house. And she had a sister named Mary, who seated herself at the Lord’s feet and was listening to His teaching. But Martha [overly occupied and too busy] was distracted with much serving; and she came up to Him and said, Lord, is it nothing to You that my sister has left me to serve alone? Tell her then to help me [to lend a hand and do her part along with me]! So I Made Cheese Jello, & You Should Too! Ok, so that’s probably not the most appealing title for a blog post! However, if you will just hang with me, I’m going to show you how to make a homemade version of the cheese-like block that we’ve all bought to make our rotel dips, chicken spaghetti, and casseroles so ooooey and goooooey! Why would I choose to do this??? I have a hip that bothers me a lot. I’m even seeing the chiropractor off and on to make sure the pesky thing doesn’t go rouge and gets out of place. My hubby and I prefer to do things as natural as possible. The hubs suggested that I start taking collagen to help my joints. We got some beef collagen, and I tried to take it. I put it in broth. I even tried putting some it soup. Y’all, it was SO GROSS! I can’t even tell you how gross! Imagine jello soup! The collagen ended up setting in the pantry for a long time! I finally decided that my body needed it, and so I determined to find a yummy way to get this stuff in me! I am a lover of most all things cheese! My husband, staff, and volunteers will verify that I eat nachos almost daily. I can’t think of a day that I go without some kind of cheese or dip! I can turn anything in to a nacho! I began to research how to make my own cheese-like block. We all know the one. The block is a yellow-orange and comes wrapped in foil. I know that the store bought version is full of chemicals, so if I can make this naturally, as well as getting this collagen to my joints… it’s a win-win! I found a few recipes online for the cheese-like block, but I found that I tweaked them before I settled in on one that I really like. The great thing about this recipe is you can have any kind of cheese-like block you want by varying what type of cheese and seasonings you use. For this recipe, I used a mix of white cheddar and sharp cheddar shredded off the block. I don’t like using pre-shredded cheese. The pre-shredded bags are full of corn starch and preservatives that I can live without. I didn’t put any extra seasonings in this first attempt; however, I believe the next time I make it, I will add some paprika, onion powder, and cyan pepper. I’ve also included a similar recipe that I used to make a cheese spread for crackers. It taste like the squeeze cheese you can get in the cracker aisle of the big box store. I’ve been eating on that every morning since I made the original batch. Enough of the why… Let’s talk about how! The first step is to line a mini loaf pan with plastic wrap. Let’s be honest here… You can line anything you want with plastic wrap to hold the goodness, but if you want it to resemble the cheese-like block when you’re done, use a loaf pan. The next step is to grate 3 cups of cheese. Again, I used a mix of white cheddar and sharp cheddar. Put your 3 cups of cheese in a blender, so it will be ready for the magic! In a small pan, pour 3/4 cup whole milk, 2 tablespoons of heavy cream or half & half, 1 teaspoon of salt, and 2 teaspoons of your gelatin. Put the pan on medium heat. You’ll need to use a fork or whisk to stir the mixture as it warms. It’s important to stir so that the milk doesn’t burn on the bottom of the pan. When the liquid warms to the point that you can see steam coming off the top (NOT BOILING), you’re ready for the next step. Just a note here… I use Himalayan pink salt. It’s SO much better for you than table salt. It’s full of minerals that your body needs. Every time you eat food with this type of salt, it’s more heart healthy than normal table salt, and it helps to restore the minerals in your body. Turn your blender speed on low. Now take the steamy milk mixture and slowly add it to the blender through the top. Once added, replace the doo-dad that covers the top and turn your blender up to medium speed to process. If you find that the mixture isn’t coming together well, you may have to increase the speed of your blender or use a tamper. Once the mixture is thoroughly combined, stop the mix and get a spatula to help you rake out the yummy goodness. It looks like this, by the way, when it’s done. Now, scrape everything out, and put it in the loaf pan. Place the loaf pan in the fridge for a couple of hours for everything to firm up, and you’re done! I just added some milk and rotel, and I heated it in the microwave. Now, this doesn’t make as much as one of those big orange cheese-like blocks, so you will have to adjust your dip recipes accordingly, or you could always just make more. It will keep for at least a week in the refrigerator. Like I said earlier, next time, I’m going to add a few spices to jazz it up. Just think…. Every time you eat this, you are adding minerals to your body and doing good by your joints! Grate 3 cups of cheese and place the cheese in a blender. Add milk, cream, gelatin, and salt to a small sauce pan and heat on medium heat until there steam coming off the top of the mixture. Slowly pour the liquid over the cheese through the pour spout at the top of the blender. Turn the blender on medium until combined. Spread mixture in a plastic wrap lined loaf pan and refrigerate for 2 hours. It will remain good in the fridge for up to a week. The method is exactly the same as the cheese block. Our buts get us in so much trouble. I know there have been many times in my life that I felt like God would have me do something, and I would say, “But God…” God isn’t looking for our excuses; He’s looking for our excellence. My dad, Larry Doggett, used to tell me all the time growing up not to “slop-bop.” Ecclesiastes 9:10 tells us that if we are going to do something, “do it with all of our might.” You know there were many people in the Bible that had the opportunity to make excuses; however, through faith, they rose to the occasion to which God was calling them, and the good Gospel news is we can too! Be encouraged, by looking at these people of the Bible, that we don’t have to live a life full of what if’s and excuses. Joseph had a dream. He was hated for his dream. He was sold into slavery by his brothers and sent to prison wrongfully. If you study out the life of Joseph in Genesis, you will find that he was excellent in all things wherever he went. In Genesis 39, it talks twice of people who could see his excellence in all things and how he walked with God. Even in prison, they gave him the charge over all the prisoners. He was found excellent and trustworthy in every situation. Eventually, he was brought out of the prison and placed in the palace as second in command in Egypt. He ended up saving the people of Israel, his family – even those that betrayed him, and Egypt from famine. In Exodus chapters 3 and 4, we see God appearing to Moses in a burning bush. To be honest, I’m not sure what I would do if I heard the voice of God coming from a bush. God wanted to use Moses to deliver the people of Israel from slavery imposed by his adopted family. Moses thought no one would believe him, so God took away his excuses that he gave one by one by giving him signs to prove that he was telling the truth. However, Moses still didn’t feel like he could do what God has asked of him. Moses then told God that he wasn’t good at public speaking. God then told him that He would send Moses’ brother Aaron to help. What if Moses had let his excuses get the best of him? What would have happened to the people of Israel? What have you been saying, “But God….” to in your life? I dare you to get your but out of the way and let God have His way! I was asked to write a weekly devotional for the local newspaper for the month of September. I wanted to share them with you as well, so here we go…. Habakkuk was to write the vision and wait. Wait on what? The appointed time. Ecclesiastes 3 tells us there is an appointed time for everything. God has a clock, and unfortunately, it doesn’t line up with ours most of the time. So, what do we do in the waiting? Proverbs 3:5-6 tells us to, “Lean on, trust in, and be confident in the Lord with all your heart and mind and do not rely on your own insight or understanding. In all your ways know, recognize, and acknowledge Him, and He will direct and make straight and plain your paths.” My job while waiting is to lean into Him, acknowledge Him, know Him, rely on Him, obey Him. There’s a pattern here. I can’t move when I want things done because I want things done yesterday, and that’s not how this works. The very creator of the universe wants to be involved in my everyday, grocery shopping, work and school going life. He’s longing for worship and fellowship everyday not just Sunday. He longs for us to wait for all the bubbles to form and things to line up before we flip. I challenge you to “stand fast in faith” while you wait. Know that sometimes, you may have to wait a while, and that’s ok. My Mammaw always took my Mom and her brothers and sister to church when they were growing up, but my Pappaw would never go. He had gotten hurt in church early on in their marriage, and he told her, “If this is how these Christians are going to act, I don’t want any part of it.” He allowed the misguided actions of others to control him, which is never a good thing, but that story is for another time. My Mammaw continued to be faithful. She continued to get all four kids ready every time the church doors were open, and she was faithful to continue to pray for my Pappaw. She prayed that God would soften his heart, and she prayed that Pappaw would want a personal relationship with God once again. Mammaw was scared at first; however, her fear turned to tears of joy as Pappaw began to share how he felt like God had awoke him out of sleep. He told her that he felt such an urgency to make things right with God and renew his relationship with God. Pappaw had a dramatic shift in his life that night. He truly repented! He even called Mammaw’s pastor the next day and wanted to go out visiting the sick with the pastor that weekend. FIFTY YEARS! That pancake had to cook a long time! This is the first year I’ve canned marinara. To be honest, I didn’t really know how to make it from scratch. I always just grabbed a packet of spice mix, tomato paste, and a jar or two of pre-made sauce. This year, we’ve had SO many tomatoes. Like the old woman that lived in the shoe…. We didn’t know what to do! So, we got creative and spunky, and my mom and I set out to figure out marinara. If you get one of these stubborn tomatoes, never fear. Just leave it in the water for a while, take it out, and puncture the skin with a spoon or knife or whatever you have. NEXT STEP: Peel the tomatoes. I don’t have a picture of this step because my hubby was off in Dumas tearing down a building our church has been given. I couldn’t take it myself because I had on gloves and tomato juice was…. Well, let’s just say it’s not good for the camera! Just take the cooled tomato and use your hands to peel off the skin. This part is MESSY! Not gonna lie to you about it, but the end result is worth it! I peel them in the sink with a trash can close by me. After the skin is removed, I hold the tomato by the top (where the core is located). Then I use my other hand to pull all the tomato goodness away from the core. 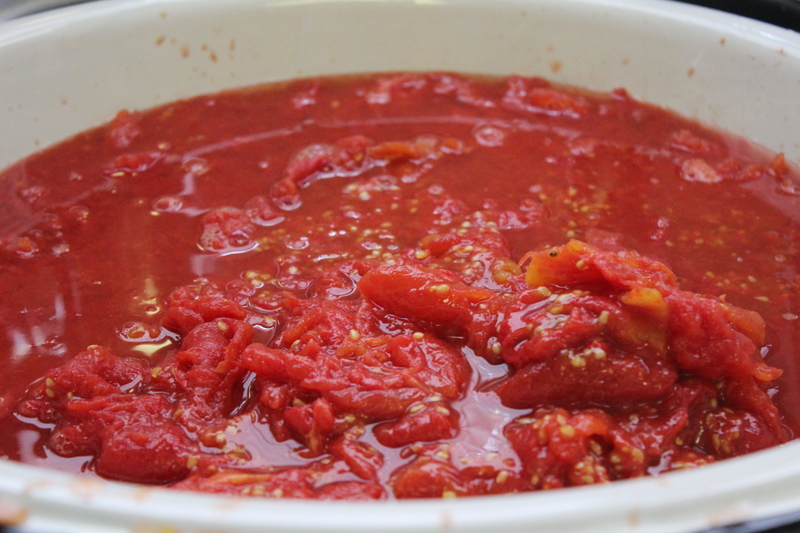 This tomato wonderfulness goes into a bowl and the core goes in the trash. You could skip the scalding and coring by hand process by peeling and coring them with a knife. You don’t want to do it that way… but you could. That my friend is what luscious tomato-ness looks like! Next for the add ins. We added LOTS of chopped onions. 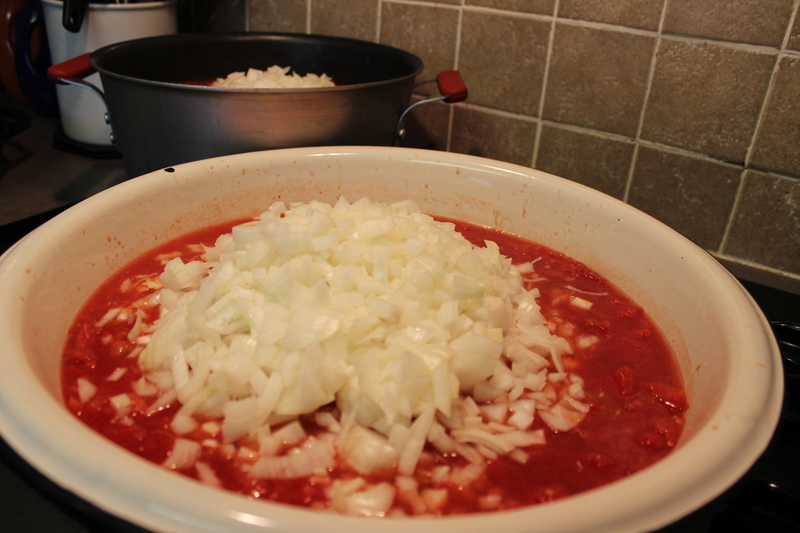 We had 2 5 gallon buckets of tomatoes, and we added 3 pounds of chopped onion. You can add as much as you like. We sometimes add more. Then, I added 1 tube of Gourmet Garden Italian Herbs Paste (I divided it between my two pans of tomatoes), 1 tube of Gourmet Garden Basil Herbs Paste (again, divide between the two pans), and I added 2 tablespoons of garlic paste per pan. I also added ancho chili powder, salt, and pepper to taste. 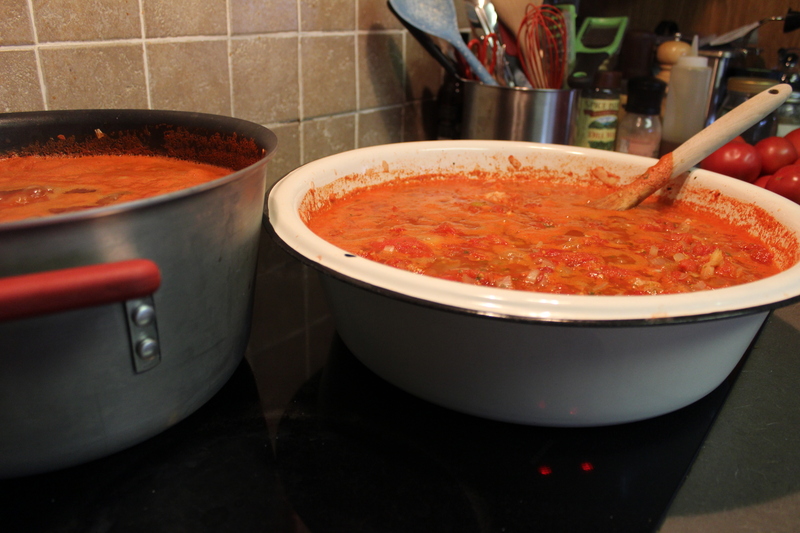 Now, in my previous batches of marinara, I used herbs from my front porch. I picked most of them, and I didn’t have enough to do a whole recipe, so I got the fresh herb paste from the produce section at the store. You want to cook it on the stove at a simmer until it reduces by half. It takes hours for that to happen, so don’t get impatient. You will need to stir it from time to time or the tomatoes will start sticking to the bottom of the pan. 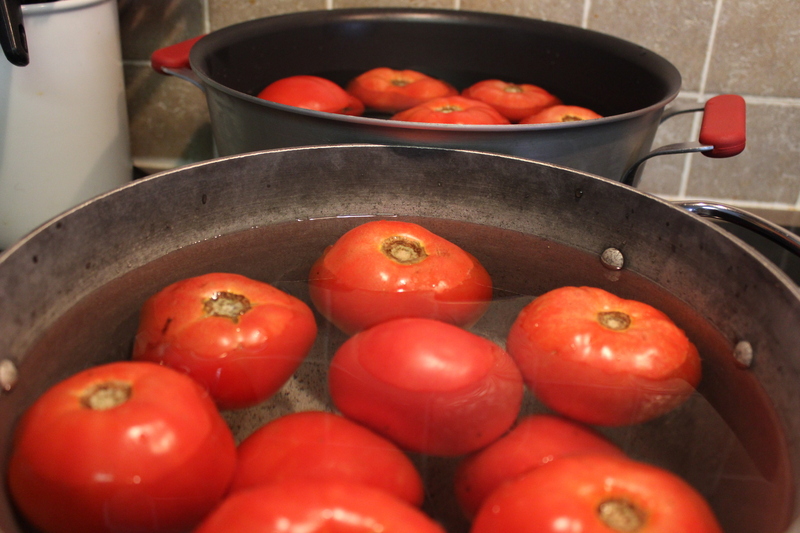 I make sure that the tomatoes are simmering almost to the point of a boil. I put the marinara in the jar, place the hot lid on the jar, and screw on the ring VERY TIGHT. THEN FOR THE TRICK….. ARE YOU READY? ….. I turn them upside down until they completely cool! WHY? Well, you won’t hear very much of that popping noise that goes on when you can if you do that. Also, we want the heat to concentrate at the seal to make sure that they get completely sealed! That’s it! I usually leave mine upside down overnight. I like to make sure the seal has plenty of time to get hot. I know that’s not quite the traditional method….. But have we ever known me to be very traditional? Exactly! I hope you’ll try making your own marinara. Not that I”m trying to sell you on it or anything, but the store bought and powder packet versions always gave me and the hubby heartburn. Not the homemade stuff! Plus, this is free of all those chemicals and what not that companies put in the food… YUCK YUCK YUCK!!! And you’re supporting your local farmers. Now, that’s a good thing! Peel and core all the tomatoes. I use the scald and peel by hand method, but whatever works. combine all the ingredients and stir. Simmer on the stove until it reduces by about half. 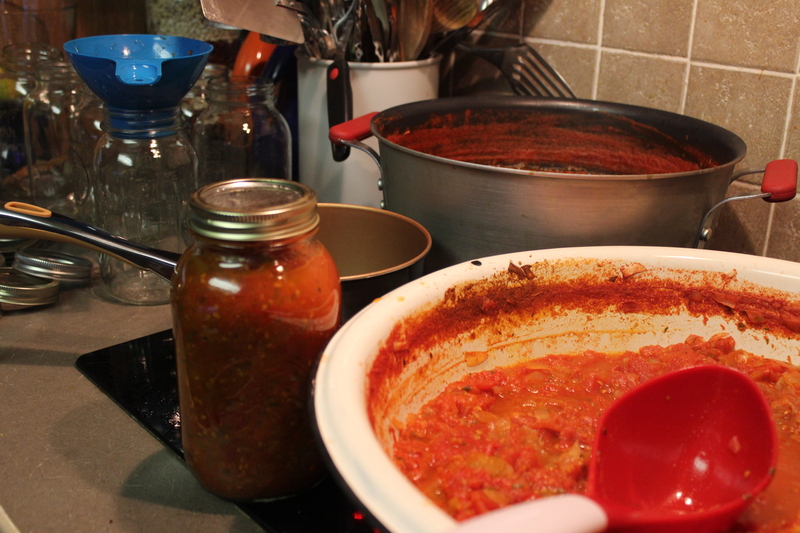 Pack and jar while everything is simmering (lids included). Then flip upside down on the counter overnight. Did you try this? Do you like it? Let me know. 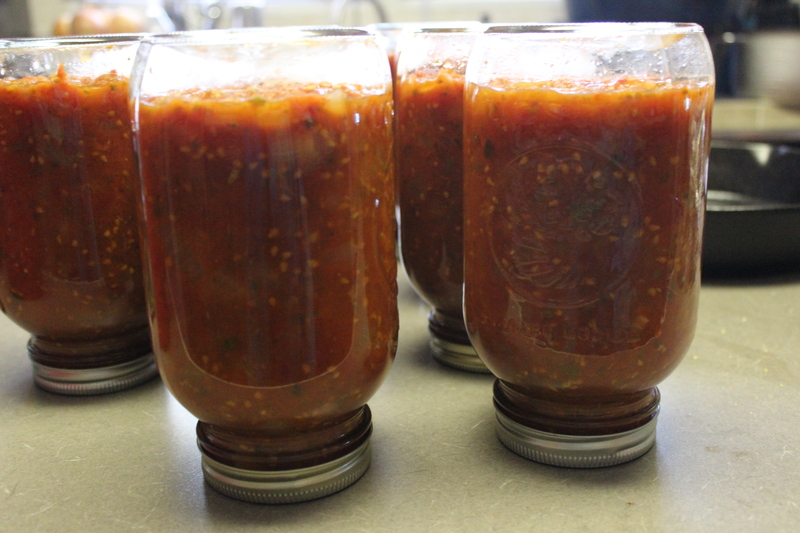 Oh, and if you have canning tips you’d like to share, comment below.